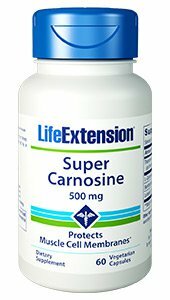 SUPER CARNOSINE is a multifunctional dipeptide composed of the amino acids, chemical combination of the amino acids alanine and histidine. Found in high concentrations in body tissues including, skeletal muscles, heart muscles, nerve tissue and in the brain. Works as a chelator of heavy metals. Promote wound healing. Laboratory animals treated with carnosine were found to have faster and better wound healing rates compared to controls. This has potential applications for treating burns, wounds following surgery, or during nutritional preparation for surgery. Assist in helping to eradicate Helicobacter pylori, an organism that has been linked to peptic ulcer and stomach cancer. DIRECTIONS: Adults, take two or three capsules per day, or as recommended by a healthcare practitioner.